Reduce your credit card fees by up to 43% and simplify your credit card transactions at the same time—with MKT Credit Card, a vertical add-on solution from Bailey Enterprises for AccountMate that works in tandem with American Payment Systems for credit card processing. Why provide Level 3 data to your credit card company? For business cards (not consumer cards), credit card companies will reduce your interchange fees when you provide industry-standard Level 3 enhanced transaction data, like line item details, tax amounts and invoice numbers (effectively, customer invoice line item detail) . Simply put, you’re typically paying the credit card processor 2.5% to 3% of a transaction if you’re keying it on a website or via a hardware terminal, neither of which support Level 3 detail. But with the MKT APS combination, that’s reduced by 0.5% to 1.5%. For clients who process mostly business-class credit cards, at NexLAN we typically see total credit card processing fees reduced by a third, resulting in one larger client saving $100K/year – straight to their bottom line, automatically – while saving time and effort as well. APS’ average mid-market integrated ERP account saves $10,000 to $20,000 annually. When add-on software fully integrates with AccountMate, like MKT Credit card does, that means data will transfer seamlessly across your workflow to where it’s needed. The MKT Credit Card plug-in allows you to enter credit card payments directly in AccountMate and the payment is then available in your account the very next day. You save time by not entering it on your bank website and THEN in your system, and it’s more accurate as there are no typos between the two systems. You recorded the payment twice! You recorded the payment zero times! With MKT Credit Card from Bailey Enterprises, you can reconcile all transactions. They’re listed in your AccountMate Cash Receipts and Refund reports. Preauthorization: If you wish, you can also pre-auth your customer’s card to block out funds and confirm their credit limit is high enough to pay the transaction amount—before you commit your inventory and your time to process the order. Read the NexLAN NewsLine article for more information from Kevin. 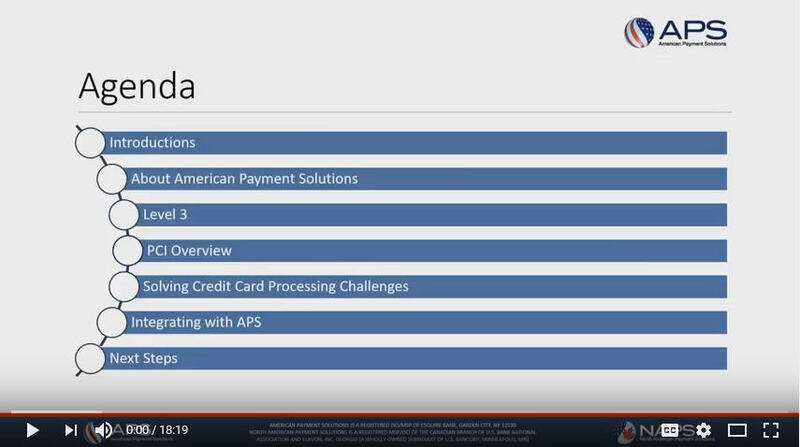 The preferred processing gateway is American Payment Systems which, besides offering highly competitive processing rates, passes the Level 3 information to the processor resulting in drastically lower costs for business class cards. With American Payment Systems, you get fast 12-hour funding. Wouldn’t it be great to see the previous day’s credit card payments in your account when you arrive to work in the morning? And all of your credit card transactions will automatically be checked against the available interchange rates and different card types you’re accepting, to ensure that you’ll receive Level 3 rates for as many transactions as possible, every time. Oh yeah, and if you’re wondering about PCI compliance, sensitive credit card data is stored encrypted (PCI compliant) in American Payment Systems’ tokenized vault in the cloud. Credit card numbers are never stored in your system – only “tokens” unique to you which point to the actual card info in the secure cloud of American Payment Systems. Request a free no-obligation analysis of your most recent processing fees so you can see what savings you qualify for. We’ll chat about your particular transaction types and volume to give you an estimate of what your savings would be. There are only two reasons to make changes to your accounting and financial management software. To save time (and hopefully scale your business) or save money (and increase profitability). On a good day you can accomplish both of those goals with a single system improvement, and this is one of those days if you accept customer credit card payments. It’s free to look, and the analysis to let you know the expected savings of Level 3 processing for your exact business is also free. We’re not high pressure so you have nothing to lose – and only time and money to gain.